After a long day or week, many people choose to unwind in a relaxing bath. But if your current bathtub has worn out or no longer fits your lifestyle needs, we can help. From selecting a new surround material to putting a new bathtub in place, our team is ready to give your bathroom a new focal point. Replacing your current bathtub may seem like a simple three-day-weekend project, but many homeowners come to find that it's not as easy as it sounds. Our plumbing repair company has the experience, skills, and tools necessary to make any bathtub replacement or installation a breeze. We'll explain every step of the process, including whether any structural repairs are needed from mold growth or water leaks. If your residential bathtub needs an upgrade or you want to find the perfect model for a new construction project, contact us! What Issues Indicate The Need For Bathtub Replacement? Providing functionality and elegance in one, a quality bathtub serves its purpose for many years. Yet, even the most well-maintained tub won’t last forever. 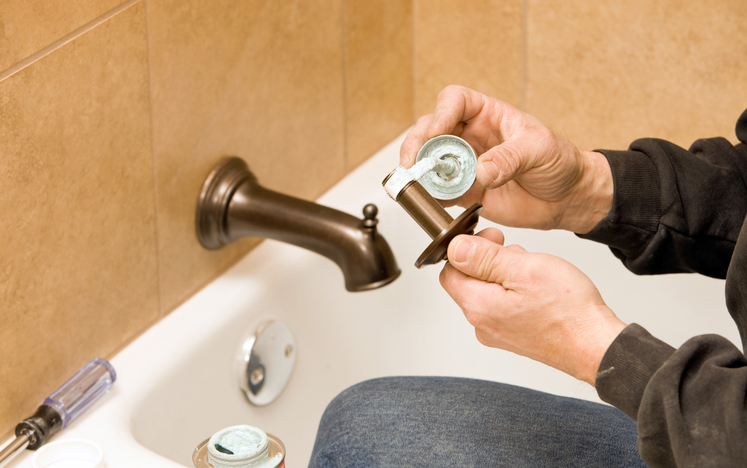 Our technicians have years of professional experience and the most up-to-date expertise to meet your residential plumbing needs. These are three common signs it’s time for a new bathtub. If you or your family members have a hard time getting into or out of the bathtub, or you find yourself tripping over the tub while in the bathroom, it’s time for a replacement. A bathtub should be useful and soothing, not impractical and in the way. New bathtubs have a number of features that can be fitted to your lifestyle and needs, such as grab bars and handles for safety improvements or anti-slip floor covers and in-tub lighting just in case. We know that you intend to scrub the bathtub, but you’ve been busy. For some tubs — specifically old and excessively used bathtubs — the black, gray, brown, or other color surface stains will never come out despite the excessive scrubbing. In year’s past, bathtubs were manufactured with minimal features, if any, and were highly susceptible to stains. Bathtubs made today come in all shapes, sizes, colors, and features with stain-resistant finishes. It’s possible that a small puddle of water near the bathtub could be from water sloshing out while the bath was in use. But a greater possibility is leaking pipes or even a crack in the basin of the bathtub. When you contact us for plumbing and water leak services, we will arrive promptly, inspect the issue, identify the source of the leak, and discuss the best options for solving the problem. While some leaks can be fixed, frequent repairs and recurring leaks mean it’s time to switch out your old bathtub for a new one. Contact us to speak with a plumber. When Is The Best Time To Install A Bathtub? New construction is a great time to let Sunshine Plumbing and Gas install a new bathtub. Our team can help you select a bathtub style that complements any newly constructed home or business. We’ll guide you through considerations, such as how big you’d like the bathtub to be and if a shower will be included before installation begins. Here are four popular bathtub styles our Ocala plumbers frequently install. A whirlpool bathtub is comparable with a Jacuzzi as both feature massage water jets to create a spa-like experience in your home. This type of tub is often larger in size than regular bathtub models and can accommodate space for more than one person at a time. Also called a clawfoot or soaker bathtub, a freestanding bathtub is much deeper than a regular bathtub. A freestanding bathtub is often used to create a focal point in a new construction bathroom and offers homeowners a luxurious space to relax within. The exposed side of a corner bathtub can be curved or straight, depending on the chosen style. Though the overall bathroom size can limit the size of a corner bathtub, most are five feet in length. Corner bathtubs fit snugly into a corner of the bathroom. Known as the classic bathtub, the size of a recessed bathtub is limited by wall space in the bathroom. Recessed bathtubs are permanently mounted in the bathroom structure, with either a portion or all of the bathtub resting underneath the finished flooring.